Last February I was talking to my friend Nancy Shroyer, the Nancy behind Nancy’s Knit Knacks. I was sharing with her my “dream” lazy kate! It would have a tilting tension system, and it would have a traditional cord tension system, and it would have an open yarn guide, and it would have the options to put a yarn guide in front of each bobbin, and it would be big enough to fit jumbo bobbins, and it would be able to hold cones.. and on top of it all, it would all come apart and fit into the base… Sounds amazing right? I mean, traveling with a lazy kate is such a Pain in my TUSH- with the rods and keeping everything together…. So that was my dream.. and I told Nancy how awesome it would be and that spinners everywhere (especially my creative spinner peeps) would go crazy for it! Just for the travel part!! Then a few months ago I got a call from Nancy and her husband, Bob. They finally had started WORKING on my lazy kate!! They were actually going to see if was going to work. I was so excited.. I knew this was going to be something good. Then just before I left for California they sent me the prototype. They had created magic. Not only that, but they had already shown it at TNNA to a very positive response!! SO.. now it’s in production and available for order! Everyone loves it JUST as much as I thought they would! I love mine SO much, I’m actually planning two and three plies!! The retailers are ordering multiples and selling out of them! I will have them in my shop starting tomorrow. They will be drop shipped directly from Nancy! Well what can I say. We had a highly successful lazy kate for the past 10 years. Others tried to copy our design, but our features and quality still reigned supreme after all of these years. Then we developed the Lazy Kate 2 (officially the Anything but Lazy Kate™) at the urging of a local art yarn guru (Esther Rogers). We dragged our feet for a long time (1 year) but then, we eventually got our act together (and boy, did we!) and got the product designed. We made sure that we met both Esther’s design goals as well as ours and then we carefully refined the design. Many custom designed parts were needed for the LK2 which always takes time and costs a lot of money. But then comes the day when all of the parts are in and we assemble the first production unit. We run our tests and WOW! We then realize that what we had hoped for in this design was now a reality! The unit is, indeed, a truly unique product which has more capabilities than any other Kate on the market. It employs the “new age” tilt-back design for art yarn users and it also includes the traditional tensioning cord system for regular lazy kate users. But then we go one more step beyond that by adding a fully adjustable yarn guide tensioner for each bobbin! 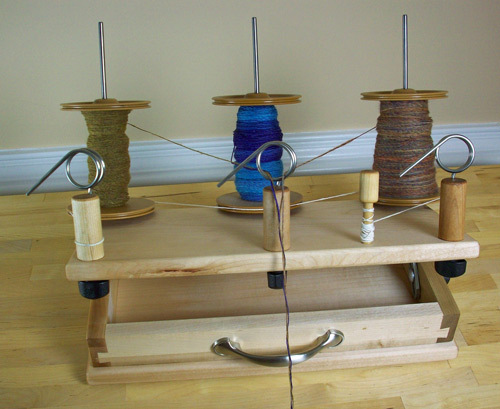 This means that the user can tension their yarn 3 separate ways. Never in the history of lazy kate production has there been anything like this. But we didn’t stop there. We gave the user a handle and a high quality hardwood case that holds all of the parts – in style. You can carry it like a miniature brief case. I would never have imagined prior to starting this project that such a great kate was possible, but as always, when your design team focuses on excellence and providing the end user with all the features that we, ourselves, would want, then the team pushes itself to produce the best design possible without too much regard to cost. In the end, it is the right thing to do. Design for function and form will follow. 8-31-12 update – we just added a new option for the ABLK, a cone accessory kit which allows the user to mount cones of yarn on the ABLK. A simple design that works really well. We do not bundle it with the ABLK because the majority of users will not use a cone. But for those of you that do, you will find this to be a most competent cone holder with tensioning. I hope that each of you will agree after you try the new Anything but Lazy Kate™! Yes, there are larger rods available that fit the country spinner. It’s a small additional charge, just let me know when you order and I can invoice you for the rods! The larger rods also fit the cone holder as well!! Threeravens » 10-11: Community Thursday!